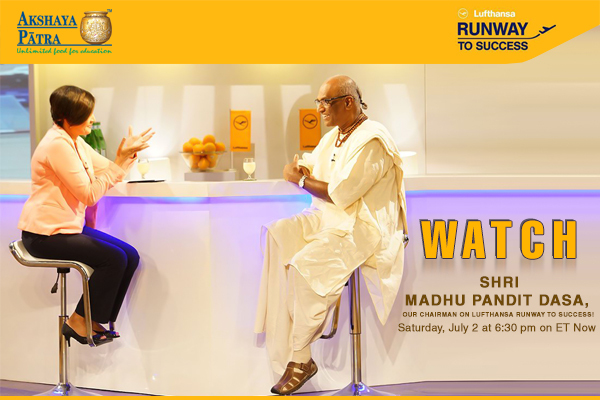 As an iconic leader in social platform, Shri Madhu Pandit Dasa, our Chairman, was invited to be on the television show - Lufthansa Runway to Success. The series, which has enjoyed three extremely successful seasons, is part of an unprecedented initiative to nurture the next generation of business leaders in India in partnership with industry stalwarts. The multi-stage endeavour is collaboration between ET NOW and Lufthansa, together with TiE, the foremost global non-profit network dedicated to fostering entrepreneurship. The TV series was preceded by a nationwide outreach inviting startups and SMEs to Runway to Success Mentorship Camps where they received the benefit of strategic advice from business experts. The series has received over 100,000 entries over its seasons, with its winners and participants already making their mark in the business world. Each year, 21 finalists from the entries received are selected to compete for the Grand Prize, which includes a sponsorship to Stanford University’s prestigious Design Thinking Boot Camp, a Business Class return ticket to the US, as well as coveted mentorship from TiE. Each episode of the television series is divided into two segments. 1. Showcasing the path-breaking success story of the iconic leader as an inspiration to young aspiring entrepreneurs. 2. Featuring three startup contestants presenting their businesses to the icon, who then mentors them and selects an episodic winner, together with a venture capitalist. Over the years, this commitment to showcase and nurture India’s entrepreneurial talent has been supported by leading luminaries across sectors.